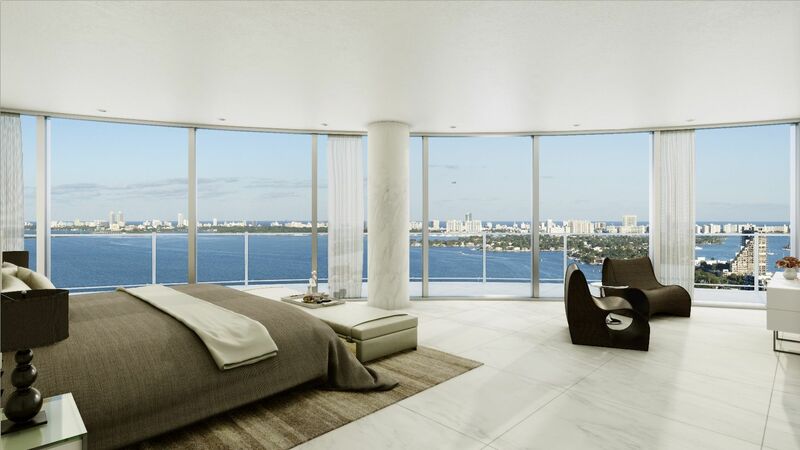 Ryan Serhant from Bravo’s Million Dollar Listing New York has recently announced that he has partnered with Aria on the Bay in downtown Miami to sell its stunning penthouse. Listed at $12.9 million with Nest Seekers International, the 9,592-square-foot home boasts 10 bedrooms and bathrooms, over 6,630 square feet of outdoor space and dominates the top three floors of the 53-story luxury building. Plus, it offers an open floor plan that takes advantage of its 360-degree views. The waterfront building on Biscayne Bay won’t be ready for move-in until it is completed in 2017, but the penthouse can be snatched up right now. Designed by acclaimed firm Arquitectonica, the opera-inspired Aria on the Bay features a scalloped glass façade that has been influenced by the shape of wave crests, as well as curved balconies meant to evoke those found in opera houses. “Two blocks north of the Adrienne Arsht Center for the Performing Arts, Aria’s semi-circular balconies make reference to those inside the classic opera houses. They playfully stagger creating a series cylinders in performance. The arrangement could also be interpreted as a musical score, or a series of curves dancing to a tune,” says Bernardo Fort-Brescia, Founding Principal of Arquitectonica. Not just nearby the Adrienne Arsht Center, the building is also close to the Perez Art Museum Miami (PAMM) and the upcoming Patricia and Philip Frost Museum of Science at Museum Park. Now, back to the penthouse. It has a formal living room, dining room, entertainment area and a kitchen equipped with top-of-the-line appliances from Bosch. South Beach, Biscayne Bay and the Atlantic Ocean can all be seen from the floor-to-ceiling windows or from outside on the wraparound balcony, which every main room has direct access to. Last but not least, the spa-like bathroom boasts Brizo faucets, marble accents, a large walk-in shower and an overflow bathtub with jets and a chromo therapy system.